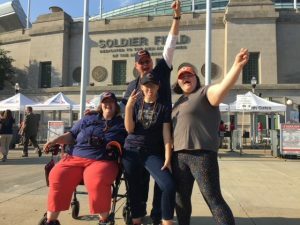 Game 7 – The Bears Help Make Warrior Wishes Come True At Soldier Field! After an insane first week of our 2018 “All32in17” mission. 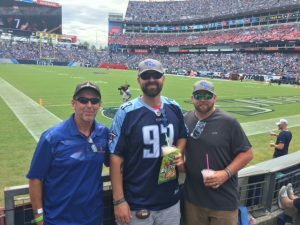 My dad had a relatively easy week this week & kicked off week 2 Thursday night in Cincinnati. 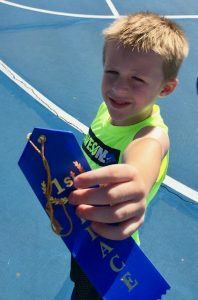 He got to come home to watch Xander compete in a toddler track meet before heading out to Nashville to make Wishes come true in Sunday. My dad made his way to the bus station Immediately following the game & headed back to Chicago to host warriors at the Monday night Bears game. 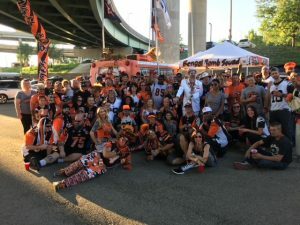 He took a quick 45 Minute “pit stop” at home jumping on a train to Downtown to meet Michael Pace & his family at one of the best Bears tailgates in Chicago! Michael proudly served our country in both the Navy & Army. He was born & raised in Chicago, but currently lives in Iowa. He’s a life long Bears fan & was beyond excited to have the opportunity to attend his first ever Bears game! 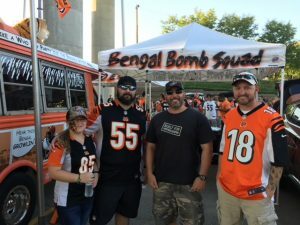 My dad met up with Michael and his family at “Da Bus” tailgate. 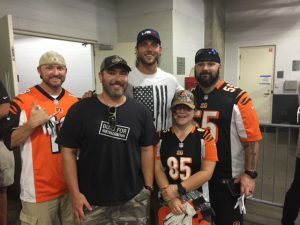 Tim & his tailgate crew have been helping us make Warrior Wishes come true since 2013. They always show the guys an amazing time & we cannot thank them enough for their support! While enjoying the food & fun at the tailgate, my dad introduced the family to our friend Don, AKA Bearman. If you have ever watched a Bears game on TV, you have probably seen the iconic Bearman. He sits in the front row of every bears home game in his themed Bear costume & cheers on his team! GRRRRRR!!! The group took some pictures with him & his car! On their way into the stadium, the Pace family stopped at the fan fest located just outside Soldier Field. Mike and his family really enjoyed playing all the games and activities. Of course they also stopped in front of the stadium with their New Era Caps! Thanks to our friends at the Chicago Bears, Mike had a once in a lifetime opportunity & got to watch the pregame warmups from the sidelines! They even got to meet Chicago Bears Tight End Zach Miller! Eventually, everyone made it up to their seats to watch the Bears take on the Seahawks in their home opener! Much like week 1, the Bears relies on their Defense. Khalil Mack & the D basically shut down the Seahawks in the first half giving them a 10-3 lead at the break. The second half was a different story, the Seahawks fought back and were able to get within striking distance, but in the end fell short losing 24-17. 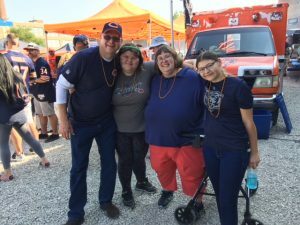 Mike & his family enjoyed watching the Bears get their first victory of the season! 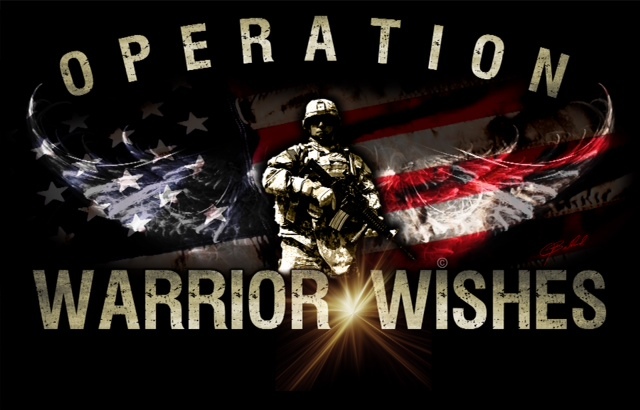 Operation Warrior Wishes would like to thank the Chicago Bears for providing Field passes, New Era cap for providing new Bears Caps for the group & Quality Inn in Schaumburg for providing accommodations for the Pace family! Most importantly, we want to send a special thank you to Veteran Michael Pace! 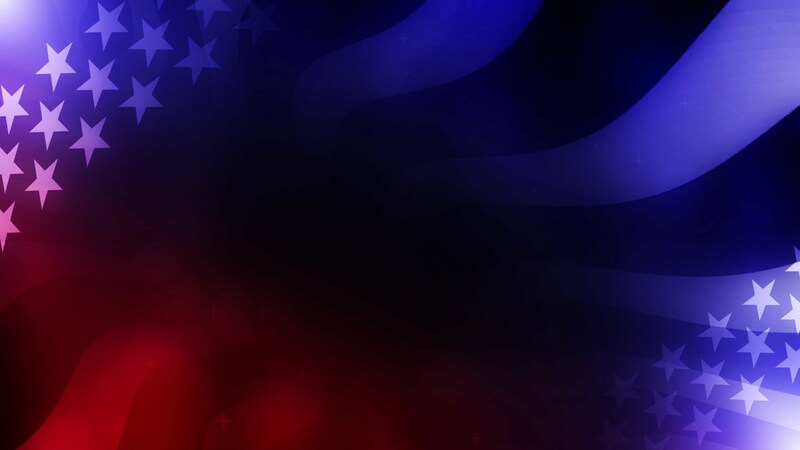 Your service & sacrifices are appreciated & will never be forgotten! With my dad in Chicago, he will have a few days to relax at home before hitting the road to Cleveland this Thursday to hopefully watch the Browns win one for the warriors! Stay tuned!